Determiners modify nouns by setting a limitation over the nouns to indicate how specific or general they are. A determiner usually appears at the beginning of the noun phrases and works as an adjective to modify the nouns. However, determiners are not necessary for every noun phrase. I want the pencil you borrowed yesterday. His house is near the bridge. 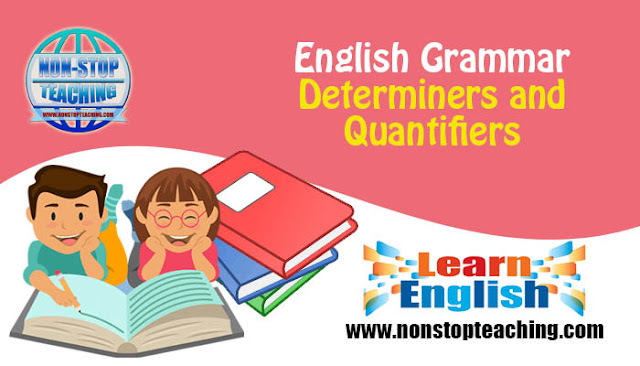 Quantifiers are also determiners which modify a noun to indicate its quantity. The quantifiers are any, all, many, much, most, some, a few, and a lot of, a little, a large amount of, none, and the cardinal numbers [one, two, three, four], etc. I have some money but not a lot of it. Many people died in that calamity. Note: There are some rules for using determiners and quantifiers. Some of them can be used only with countable nouns and some of them with uncountable nouns while others can be used with either of them. Here is a chart for the determiners to be used with countable or uncountable nouns. none, one, two, three,. . . . . .